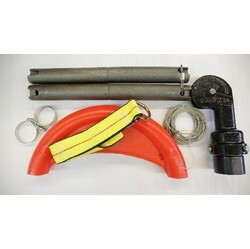 The 611 Hose Hanger is the proper way to cradle a hose while suspended from a hose retriever. The Hose Hanger supports the bend radius, protecting the hose from kinking. 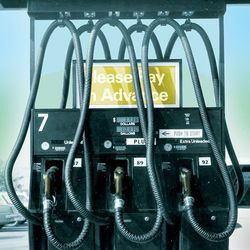 Keeping hoses suspended at truck stops and industrial sites. Protects hoses from excessive wear and damage. Prevents tangles and kinking. Reduces injury to customers from tripping accidents. The orginal and still the best. Installed at truck stops for over 50 years. This swivel head permits 360° rotation for easy service in any direction. Saving and protecting hose by extending life, and eliminating expensive insurance claims from possible accident. Keeping hoses suspended at truck stops and industrial sites. Protects hoses from excessive wear and damage. Prevents tangles and kinking. Reduces injury to customers from tripping accidents. Equipped with a heavy duty base eliminating the need to bury a 2" pipe. POMECO 100 Counterweight Hose Retractors keep excess hose off the ground and out of the way, prolonging hose life and reducing potential hazards. 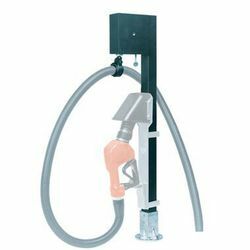 The POMECO 100 is a California Air Resources Board (CARB) certified Stage II component for use with single and dual hose dispensers as per Executive Order G-70-52-AM. 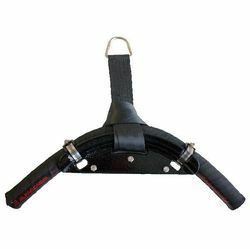 • Easy to Use - Counterweights are precisely matched to each hose configuration to ensure that a minimal pulling force is needed throughout hose extension. • Easy to Maintain - The 100 has just two moving parts, ensuring a long service life with a minimum of maintenance. • Multiple Hose Configurations - The 100 is available in a multitude of configurations to meet virtually any conventional or vapor recovery hose/nozzle configuration. Models are also available for air and water hose applications to keep hoses clear of vehicles when not in use. Keeping conventional and Stage II vapor recovery coaxial hoses raised to prevent traps in vapor line. Potential accidents are reduced. Hose life is greatly extended. Our better looking profile blends in with todays' modern dispensers. POMECO 102 Spring Balance MPD Hose Retractors keep excess hose off the ground and out of the way, prolonging hose life and preventing extra length hoses from cluttering the island. 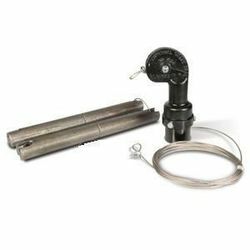 The 102 MPD hose retractors are especially well-suited for use on Multiple Product Dispensers (MPD) with Stage II Vapor Recovery hose/nozzle assemblies. The POMECO 102 is a California Air Resources Board (CARB) certified Stage II component for use with MPDs as per Executive Order G-70-52-AM. • Easy to Install - Each model number designates a custom designed retractor package that mounts in the canopy of a particular manufacturer’s MPD. Packages are shipped complete with the appropriate number of retractors and all the necessary mounting hardware for a clean, professional installation. • Easy to Use - The spring-loaded reels and stretch-resistant cables provide smooth and steady tension throughout hose extension and return. • Easy to Maintain - The removable sideplate provides full access to the mechanism for easy tension adjustment and unit maintenance. A convenient safety thumb screw is provided on each retractor to lock the reel in place during tension adjustment. POMECO 102 Spring Balance Single Hose Retractors keep excess hose off the ground and out of the way, prolonging hose life and reducing potential hazards. 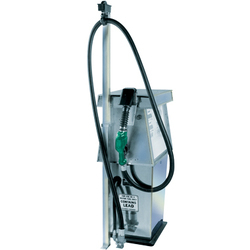 The POMECO 102 is a California Air Resources Board (CARB) certified Stage II component for use with single and dual hose dispensers as per Executive Order G-70-52-AM. • Easy to Use - The spring-loaded reel and stretch-resistant cable provide smooth and steady tension throughout hose extension and return. • Easy to Maintain - The removable sideplate provides full access to the mechanism for easy tension adjustment and unit maintenance. A convenient safety thumb screw is provided to lock the reel in place during tension adjustment. • Field Adjustable for Various Hose, Nozzle, Swivel, Breakaway Combinations - No need for upgrading components if a breakaway or swivel is added to the hose assembly. Simply change the tension setting on the spring-loaded hose reel. 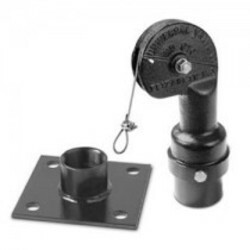 • Multiple Mounting Options - The POMECO 102 retractor housing is tapped on the top for bolting to overhead crossbars, and on the side for mounting to vertical posts. The 102 is available as a retractor kit (including post, retractor and mounting hardware) or as separate components. Models are also available for aboveground storage tank (AST) applications. 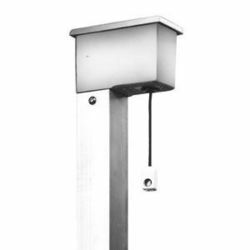 AST models include a 44'' (112 cm) post with a freestanding base. In-stock orders placed before 2:30pm EST will be shipped on the same day. Call for details.